One request of All Saints Church was giving musical support and resources to their youth group. Even though a few teens play instruments, the group hasn't done any musical actives in the past. 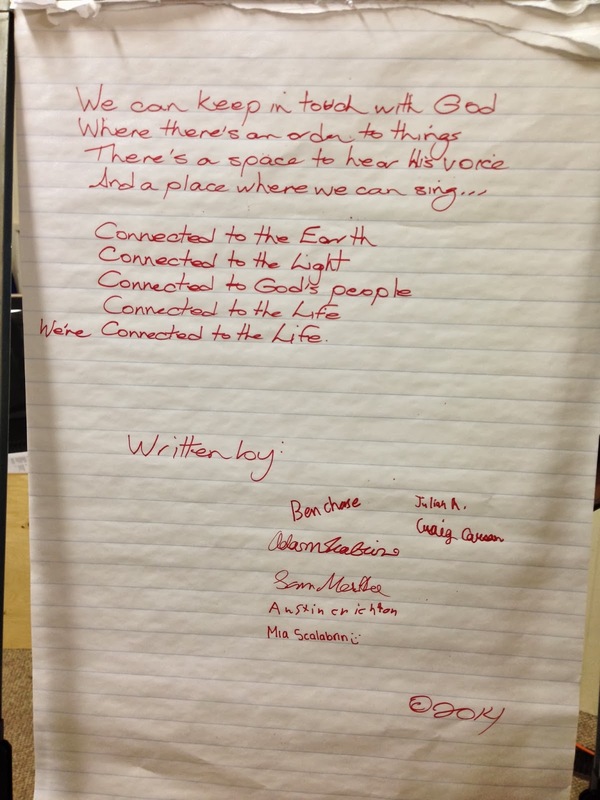 We wanted an event where everyone could participate, so we decided to have a group songwriting night. Our first task was simply to get the conversation started, so after the welcome meal, we gathered around in a circle and started asking questions about God and church. What do you like about church? What do you get out of youth group? Do you see a place for yourselves in worship? As the teens talked, we gathered the ideas on a large flip chart, so everyone could the see their collected thoughts. Next, we looked for a theme. Community was a big one, as was connectedness. We talked about the importance of a hook. Not simply a title, but an idea that would serve as the cornerstone for the whole song. From our notes, we pulled the hook "Connected to the Life." Next, we flipped over a new piece of paper, and talked about song form. They understand the basics of verse and chorus, so we found a strong place for our hook in the chorus, and started to build. As they saw the hook on the paper, the lyrics began to flow quickly. Soon it was time to create a verse. We went back to our original brainstorming. Which of these original ideas would lead to our chorus? How could we shape them into lines? Could we make them rhyme? We had a verse and a chorus - so what about music? Gerald pulled out his guitar and started playing with ideas. He gave them a few options, and the rock/pop melody with grinding electric guitar was the unanimous favourite. After a few passes, our song was done! We wrote out the lyric so the whole group could sign it. We invited the parents in to hear our results. And we gained permission to share the song during this week's Wednesday and Sunday services. I love this activity for older kids and teens. It allows them to share their own thoughts and ideas. It explores creativity and language. Because it's a group write, no one person has to carry the full pressure of a completed song. If your group has a number of musicians, you can teach them to perform the song and use it in worship. And perhaps most importantly, it allows your youth to discover, and your congregation to hear, the worship voice of our young people. What are some music activities you've done with youth groups? We're spending January and February as Musicians in Residence at All Saints Church in beautiful St. Andrews By-The-Sea, New Brunswick.